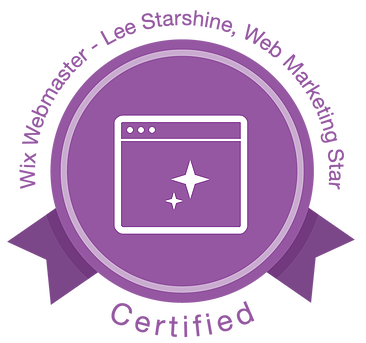 My friend and newsletter editor, Lee Starshine, recently became a Certified WIX Webmaster. You may already know that WIX is an excellent platform for most small business websites. It's mobile friendly, modern, beautiful, and reliable. Easy maintenance makes WIX especially affordable, because you can make small changes to the site yourself. Monthly fees are just $14-$19/month and they often have special offers. Lee can make a new site from scratch, re-create an existing website, or do a make-over on a current WIX website. She turns a draft of the website around in just 2 business days. "The website is live now and I LOVE IT! It has a wonderful feel. All our attention has really paid off. Thank you, thank you, thank you for all your expertise and diligence." "Working with Lee Starshine is a pleasure. She is very knowledgeable, dedicated to customer service and offers supportive marketing suggestions. I gave her my preferences to customize the color and design, then she included my very own art work to personalize the final look of the site. I am grateful for her skill to get the job done and flexibility to meet my needs." "I enjoyed working with Lee very much! Her quirky sense of humor helped put me at ease as I was contemplating the arduous task of promoting and writing about myself and my business. She asked great questions and pointed out strengths to emphasize. I felt had she listened to my desires and really helped me organize them. She has a nice way of framing info, and also listens to input with an open mind. Thanks, Lee, for being fun and easy to work with."